Ceramic non-stick cookware sets have become more popular in recent years and there are no signs of slowing down with technology evolving at a fast pace. If you enjoy cooking as much as I do, it’s important to have quality cookware that not only does a good job at preparing food, but should also be safe and easy to clean. While the popularity of ceramic non-stick cookware has been on the rise in recent years, Teflon nonstick cookware has had to deal with a few blows due to health and safety concerns. So what is ceramic cookware all about, and why are more people moving away from Teflon cookware? 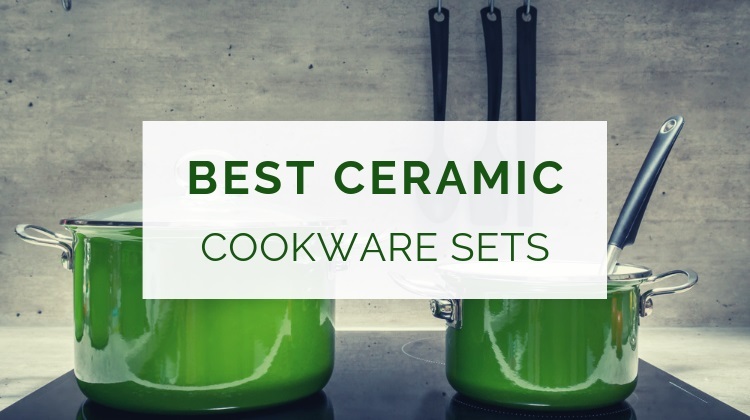 Let’s have a closer look at some of the best ceramic cookware sets available. When you’re looking for nonstick cookware, you will most likely be choosing between Teflon coating or ceramic coating. Before we dive into ceramic cookware, let’s have a look at what Teflon is all about. Teflon is a brand name for PTFE, a man-made chemical (Polytetrafluoroethylene) that has been in wide commercial use since mid 19th century. PTFE has proven to be a very stable chemical and as such has mostly been used to manufacture friction-less surfaces. It’s been used as a non-stick coating surface for cookware such as sauce pans, pots and frying pans for many decades now. The reason why Teflon coated cookware has been very popular for so long is that it does a really good job at being non-sticky. Good quality Teflon cookware is also considered very durable and robust. Another man-made chemical, PFOA (Perfluorooctanoic acid), has long been used in the manufacturing process of Teflon. In recent years, concerns have been raised about the use of PTFE and PFOA and its potentially harmful effects on humans, animals and the environment. What Are the Potential Dangers of PTFE and PFOA? PTFE is considered safe as long as it doesn’t get overheated. If it does get over-heated, PTFE is known to cause health issues such as headaches, nausea, fevers, cough and chest tightness. This is much worse for pets that you may be having at home, especially birds. In fact, using Teflon coated cookware is not recommended at all if you have birds as pets at home. According to the American Cancer Society, PFTE is not suspected of causing any type of cancer. However, there has been suggestive evidence that PFOA can cause cancer in animals and humans. Luckily, PFOA has almost completely been removed from cookware coatings. Teflon for example, is not using PFOA anymore, which is great news. Other than these potential risks from breathing in fumes from overheated Teflon cookware, there are no scientifically proven risks to humans from using PTFE in your kitchen. How Can We Safely Use Teflon Coated Cookware at Home? PTFE is only a concern when your Teflon coated pan is over-heated, as the fumes can be toxic. If you don’t overheat your pan, there should not be any issue. The other concern is that the PTFE coating can break down over time and start to release toxic gasses at lower temperatures that were originally considered safe. The best way to prevent this from happening is good maintenance. Never use high heat, don’t use too much oil, and use non-toxic dish-washing tools to clean your pans (more about maintenance further below). The typical maximum heat a Teflon coated pan can handle without safety concerns is 300 degrees Celsius (572 degrees Fahrenheit). At 450 degrees Celsius (842 degrees Fahrenheit), PTFE can start to decompose which is dangerous. Always check the manufacturer’s recommended temperature guidelines. Another thing to keep in mind is that an empty pan can get overheated very quickly. Don’t wait too long with putting in a bit of oil or the food you’re wanting to cook. And if you have an exhaust fan, definitely use it when cooking with Teflon cookware. 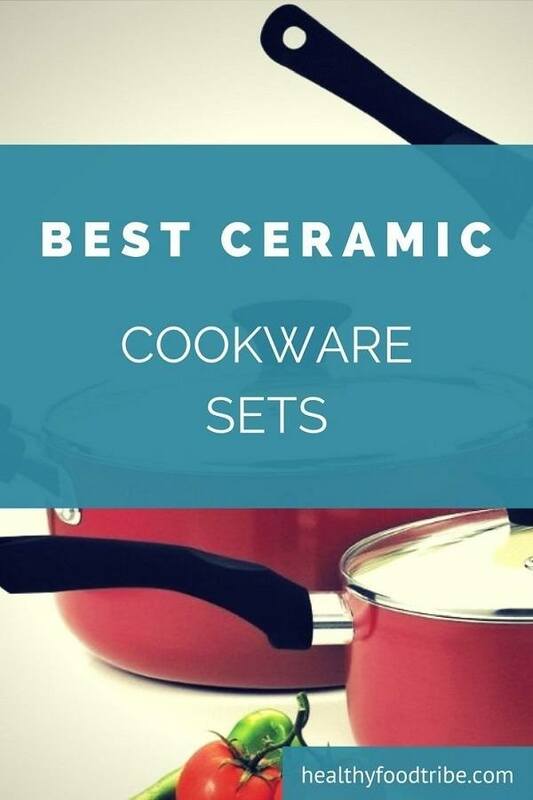 Ceramic cookware are pots and pans with ceramic-coated cooking surfaces. This is a fairly new style of non-stick cookware and is becoming increasingly popular as a safe and environmentally friendly alternative to Teflon coated cookware. A ceramic non stick pan is glazed and is completely free of PTFE and PFOA. The assumed drawback of ceramic cookware is that it has a shorter lifespan than traditional non-stick cookware. While it’s true that ceramic coated pots and pans tend to be more vulnerable, technology has advanced and the durability of ceramic coating has improved significantly. You can now get ceramic cookware with thick and improved coatings. One thing that needs to be pointed out though is that ceramic cookware does not work for induction cooking, as it’s not magnetic. Ceramic cookware is free of chemicals and is safe to use. It’s also considered to be the most environmentally friendly type of cookware on the market. And did you know that ceramic knives are also becoming increasingly popular? To further increase the shelf-life of your cookware, it’s important to stick to good maintenance. There are a few things that can easily cause damage to your ceramic pots and pans, such as excessive use of oil, overheating, over-cooking and using chemical dish-washing liquids. This may sound strange, but more than often you don’t actually need to use oil (or butter) when using a frying pan. Especially when the pan is brand new, your food won’t stick. The problem with (excessive use of) oil is that it’s hard to clean and often some oil residue will remain on the pan, even after washing. This can damage the non-stick coating of your pan. My advice would be to use only a little bit of oil for foods such as meat, and no oil for foods that don’t necessarily need oil, such as mushrooms, bell peppers and other vegetables. Have you ever tried washing your pots and pans with vinegar? I’ve been doing it for years and it works wonders. It’s far less damaging than conventional dish-washing liquid and keeps your pans happier for longer. While some manufacturers claim that their pots and pans can be placed in the dishwasher, I would recommend to always manually wash them. It’s just safer and will keep your pots and pans happier for longer. What also works is baking soda. Or even better, a combination of vinegar and baking soda with water. Mix two tablespoons of baking soda and a quarter of a cup of vinegar per four cups of water, and see if this works for you. Last but not least, I would also recommend to not use metal utensils on the pans to avoid damaging the inner surface. It’s best to use plastic utensils, or hard rubber or wood, including tongs. Also, and these tips may be obvious, don’t cut food in the pan and don’t leave an empty pan sitting on a hot burner for too long. Ceramic cookware sets are surprisingly affordable. From as low as $60 you can get a very decent cookware set, which typically includes ceramic frying pans, skillets, pots, sauce pans and glass lids. All of these ceramic sets are free of PTFE and PFOA. GreenPan is an international pioneer when it comes to healthy ceramic non stick pans, and over the years has become a trusted go-to brand for non-toxic and easy to clean cookware. GreenPan prides itself in producing cookware that is free from toxic chemicals and persistent pollutants. This 11 piece set of Thermolon coated pots and pans is manufactured without PFAS, PFOA, cadmium and lead. The patented coating will not blister or peel and does not release any harmful fumes, even when overheating the pan. The durable hard anodized exterior is designed for maximum strength and has excellent heat conduction for the best cooking results. The riveted stainless steel handles have an ergonomic and comfortable grip, v-shaped for minimal heat transfer. The lids are also made with stainless steel and are both oven and dishwasher safe. 8 inch frying pan, 9.5 inch frying pan, 11 inch frying pan, 1.5qt saucepan, 3qt saucepan, 3qt saute pan, 5.5qt casserole. The saucepans, the saute pan and the casserole are covered with stainless steel lids. Located in California, Cook N Home is a trusted factory outlet and online seller of top quality cookware products and kitchenware. This particular 10-piece cookware set with nonstick ceramic coating is PTFE, PFOA, lead and cadmium free. The ceramic coating on these pots and pans provides superior scratch resistance that will make it last longer so you get the best value for money. The tempered glass lids make sure you can continuously monitor your food. The handles contain an anti-slip coating which creates a comfortable, firm and cool grip during cooking. This set is available in bright red and bright green with the paint being resistant to high temperatures. While you can place them in the dishwasher, it is definitely recommended to wash these pots and pans manually to increase their lifespan. Dutch oven 5 quart (covered), casserole 3 quart (covered), sauce pan 1 quart (covered), sauce pan 2 quart (covered), 8 inch fry pan, 9.5 inch fry pan. 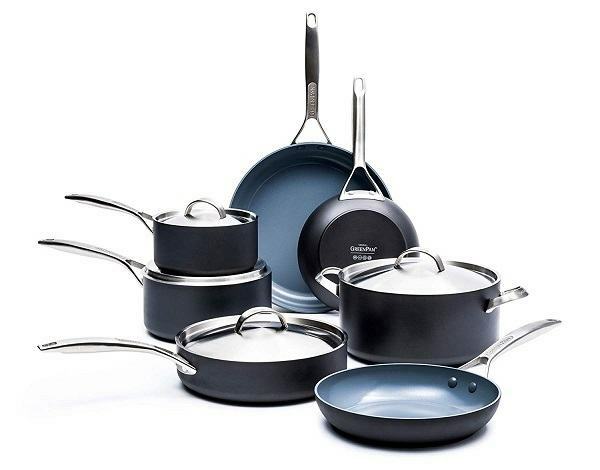 Similar to the GreenPan Paris Pro further above, this Lima 12 piece set also has a durable Thermolon ceramic non-stick coating. The key difference between the Lima and the Paris Pro set is that the lids in the Lima set are made with glass, allowing for easy food monitoring without losing the heat. Also note that this set comes with less pans but with extra utensils. 8 inch open fry pan, 9.5 inch open fry pan, 2qt covered saucepan, 5qt covered casserole, 3qt covered skillet, stainless steel multi steamer insert, bamboo solid turner, bamboo slotted turner and a bamboo fork. WearEver is an American brand that has been producing quality cookware since the beginning of the 19th century. WearEver makes a difference in providing innovative, premium quality and contemporary design cookware that is made to last. This 10-piece set is PTFE, PFOA and cadmium free and comes with top quality ceramic coating that offers superior stain and scratch resistance. The handles are made with soft-touch silicone and provide a comfortable and firm grip. The strong aluminum base provides an even heat distribution that allows for more efficient cooking. 1-quart / 2-quart / 3-quart sauce pans covered with lids, 5-quart dutch oven with lid, 3.5-quart deep saute pan with lid, 8-inch / 10-inch fry pans, 12-inch fry pan with lid and a steamer insert. GreenLife Cookware has the same parent company as GreenPan so you can be assured that you’ll be buying top quality cookware. Just like GreenPan, the GreenLife ceramic cookware sets also come with the patented Thermolon ceramic non-stick coating, designed to make healthy cooking easy. This 14-piece set contains 6 pots and pans with comfortable Bakelite handles and are oven-safe up to 350°F. As mentioned before, while this set is advertised as dishwasher-safe, I would still recommend to hand-wash just to be on the safe side. This set is available in turquoise, black and red and is very reasonably priced. 1qt covered saucepan, 2qt covered saucepan, 5qt covered casserole, 2.5qt covered saute pan, 7 inch open frying pan, 9.5 inch open frying pan and 4 nylon utensils. Hopefully this article has given you a bit more insights into Teflon vs ceramic non-stick cookware sets. GreenLife and GreenPan are two of the most reputable manufacturers of ceramic non stick pans and are highly recommended. In general, you could argue that Ceramic cookware is more vulnerable and less durable than Teflon cookware. Although with proper maintenance and evolving technology, this argument is losing ground. Ceramic cookware is definitely environmentally friendlier than Teflon cookware, as no harmful chemicals are used in the non-stick coating. Teflon cookware is still perfectly safe to use as long as you keep a few things in mind. The most important thing to do with Teflon cookware is to stick to the temperature rules. Don’t overheat your pan, as this is when toxic fumes can get released. And also be mindful about (excessive) oil use and efficient ways to clean your Teflon coated pans. In regards to maintenance of your cookware – ceramic or Teflon – you could consider using no or less oil in order to protect the coating and increase shelf-life. Also consider using alternative dishwashing tools to keep your pans even happier – white vinegar has worked really well for me.